Shenson's Kosher Meat Market was one of many Jewish markets in the Fillmore. Lost in the long-running battles over redevelopment, the displacement of its African-American population and the removal and incarceration of its Japanese-American community is the story of another era from Fillmore’s past: For the first half of the 20th century, the neighborhood was home to a vibrant Jewish culture. 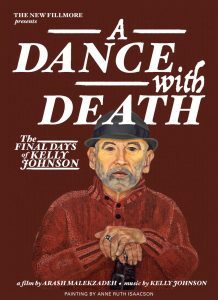 The story came alive in “Jews of the Fillmore,” an exhibition at the Jazz Heritage Center in 2009. In addition to archival photographs and other documentary material, the exhibition included a walking tour with these five stops. In 1906, Jews displaced by the earthquake from downtown and South of Market streamed into the Fillmore. Jewish shops, markets and institutions moved with them. Names like Shenson’s, Diller’s, Goldstein’s, Green’s, Goldenrath’s, White’s, Schindler’s, Altman’s, Waxman’s, Langendorf’s, Koblick’s, the Webster Street Shul, the Golden Gate Avenue Shul, the Geary Street Temple, the Yiddish Cultural Center began to fill in the Fillmore landscape. At 1312 Fillmore Street, now the home of the Jazz Heritage Center, stood the Eagle Market, called the Jewish market by the locals. 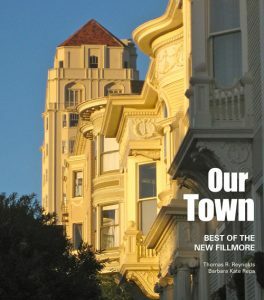 The Jewish community planted roots in the Fillmore after the quake and remained in the area until after World War II. Now walk south on Fillmore. Note the bricks in the sidewalk recalling the musicians who played the Fillmore in the 1940s, 50s and 60s, as well as some of the neighborhood’s historic Jewish businesses and institutions from earlier in the century. The American Theater opened in 1909 as part of the Fillmore Street Chutes, an amusement park that occupied the entire block bordered by Fillmore, Webster, Turk and Eddy. The park had rides, including the large water slide for which it was named, as well as dancing, movies, vaudeville acts, concessions — even a zoo. Visitors to the park might have seen the great Jewish vaudevillian Sophie Tucker, who performed there a few times. The American Theater became one of seven movie theaters on an eight-block stretch of Fillmore. More entertainment was available nearby at the corner of Post and Steiner. Dreamland Auditorium — later called the Winterland Arena — offered ice skating, dancing, wrestling and boxing matches. Briefly, in the early 1930s, San Francisco’s first professional hockey team played at the Iceland Pavilion on the corner of Sutter and Pierce. 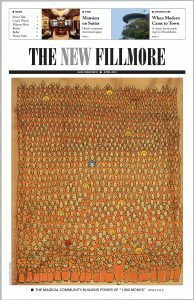 Given its entertainment tradition, the Fillmore was a natural birthplace for the jazz scene when a sizable black population arrived in the neighborhood to work in the war industries during World War II. Making kosher wine in the Fillmore. In the early 20th century the two blocks bordered by Fillmore, Buchanan, McAllister and Golden Gate were home to two synagogues, three kosher restaurants, four Jewish bakeries, five kosher meat markets, at least three Jewish delicatessens or groceries and one Jewish liquor merchant. Keneseth Israel, known as the Webster Street Shul, was at 935 Webster. The other synagogue, Anshey Sfard, known as the Golden Gate Avenue Shul, stood at 1140 Golden Gate. The Central Hebrew School, attended by hundreds of the neighborhood’s Jewish children over the years, was down the street at the corner of Grove and Buchanan. The Jefferson Market, a few blocks away on Buchanan, was one of four places that sold Kosher chickens, along with Sosnick’s, Diller’s and Shenson’s. Customers would select their live chickens, which were taken into the back of the establishment to be butchered by a shochet — a kosher slaughterer — then wrapped in newspaper and passed back to the customers. Among the nearby eateries, Diller’s Strictly Kosher Restaurant, on Golden Gate between Webster and Fillmore, was the most popular. The colorful and beautifully restored Victorian at 1057 Steiner is one of the few remaining original buildings from the Jewish Fillmore. Built in 1892 by shipping magnate Daniel B. Jackson, the building is now the Chateau Tivoli, a bed and breakfast. At different times, it was also home to two important local Jewish institutions. In 1917 it became the Emanu-El Sisterhood’s Residence for Single Jewish Women, which encouraged the acculturation of recent East European Jewish immigrants to San Francisco. Later, as the Yiddish Cultural Center, it became a focal point for secular Jewish activities — including the study of Yiddish language, literature and culture. In addition to lectures by prominent Yiddish writers from around the world, it was also a center of radical politics. Just next to 1057 Steiner was once the home of Moshe Menuhin and his family. Menuhin was a Hebrew language teacher and, for a while, the principal of the Central Hebrew School at Grove and Buchanan. His son Yehudi, who spent his early years in the house, would become one of the great violinists of the 20th century. On the site now occupied by the post office once stood the architecturally imposing Geary Street Temple of Congregation Beth Israel. Founded in 1860, Beth Israel grew at the initiative of a handful of Jews who were interested in worshipping according to the Orthodox traditions of Polish Jewry. Temple Beth Israel in ruins after the 1906 earthquake. At the time of the 1906 earthquake, Beth Israel had just completed construction of its new building at 1839 Geary. The temple was severely damaged but not completely destroyed. The 1500-seat building was finally dedicated in 1908 and the congregation remained in this grand building until 1969, when it merged with reform Temple Judea and moved out to Brotherhood Way, where it remains. The temple on Geary Street stood until 1989, when it was destroyed by a fire. In its final years it became the Duquette Pavilion, an homage to designer Tony Duquette. To the left of Beth Israel, then as now, was the Fillmore Auditorium. To the right was the Albert Pike Memorial Scottish Rite temple. This temple too has been demolished, but achieved its own kind of renown in the 1970s when it became home to the Peoples Temple, led by Rev. Jim Jones. By 1969, when Beth Israel moved out of the Fillmore, most of the Jews in the neighborhood had moved to the Richmond, the Sunset and the suburbs. Their institutions and businesses went with them. Congregation Anshe Sfard is now located on Clement Street in the Richmond. The Jewish era of the Fillmore was a vital period in the rich, multi-layered history of this ever-changing neighborhood.